This library was built as a tribute to the ancient Library of Alexandria, the legendary learning center that flourished under the Ptolemaic Dynasty in Egypt and was lost in Antiquity. It was built as both an homage as well as an attempt to rekindle some of the brilliance of the earlier learning institution. It is currently home to six specialized libraries, four museums, a planetarium, thirteen research centers, fifteen permanent exhibitions, four art galleries, a conference center, and nine institutions, and it receives around 1.5 million guests each year. 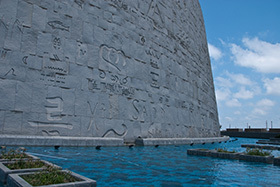 UNESCO took a leadership role in the building of this project that was first dreamed up by Alexandrian academics in the 1970s. Some claim former President Richard Nixon’s visit to Alexandria in 1974, during which he asked to see the grounds of the former “universal” library there, which no one could find at the time, was the inspirational spark for the new library. Famously, during the 2011 Arab Spring uprising, young Alexandrians formed a human chain around the library to protect it from vandalism and destruction.